The Summit Lodge is minutes from shops, breweries, hikes, restaurants, and to some of the country's BEST ski resorts, golf courses, white water rafting, and fly fishing experiences. Ski, Tube, Snowmobile, & Ice fish during the snow-capped Winter season; hike & bluebird ski during Spring; Sail on Lake Dillon and capture the heart of the Rocky Mountains in the breathtaking summer months; or watch the Aspens change color in the Fall - no matter the season, the Summit Lodge fits! Private office equipped with Wifi, desk, printer and library. Air Conditioning: YES! We are ONE of the ONLY homes in Summit County to house AC, perfect for those few smoldering summer days. Golf enthusiast?! Go no further, the Summit Lodge is surrounded by world class golf courses. 5 mins from the freeway - makes it extremely easy to find and accessible, yet you’ll feel in a secluded mountain neighborhood the second you turn in! We're Colorado Natives father & son (plus our lovely wives) duo that have been in the long-term rental business together for 10 years, and are excited to host great people in the short-term rental biz. We feel very fortunate we've worked hard to make this life-long Colorado dream of purchasing a family cabin up in the Rocky Mountains a reality. Rob (father, left) grew up in the Cherry Creek area of Denver, followed by attending University of Northern Colorado for undergrad, & engineering at Colorado State University, where he met the love of his life, his wife of 37 years & counting, Cindy. Cindy, also an engineer turned high school math teacher, grew up outside of East Lansing, Michigan, before coming to Colorado for college. Rob & Cindy live down the mountain in Arvada, & are excited to enjoy The Summit Lodge (when they don't have bookings, of course!). They also have another son, Ryan (older bro, by 11 months) who lives in Austin, TX working and excelling at Xylynx. Rob's hobbies include: mountain biking, sailing, watching Broncos football & playing fantasy sports with his sons. Cindy's hobbies include: shelling in Florida, quilting, & golfing. Together they love to host & participate in their couple's Enneagram group, play card games with friends & travel to both new places as well as their annual family trips to Anna Maria Island, FL & Lake City, MI. Matthew (son, right) grew up in Arvada & attended Colorado University Boulder for degrees in Business & Real Estate. He lives in Denver, working as a mortgage lender & business partners with his dad owning multiple long-term rental properties. Courtney, his soon-to-be wife, grew up in Northern CA & attending University of NV for Broadcasting. Matt's hobbies include sports (watching, attending, playing, you name it), training in MMA, playing the guitar, & hanging with their two dogs. Courtney's: yoga, reading & researching all things health & wellness, & obsessing over the dogs as well. Our family has grown up coming to this area our whole lives, for all seasons vacations & activities. Sailing on Dillon Lake, Skiing Breckenridge & Keystone, & a very adventurous (and singular) father/son weekend trip of what turned into snow camping & Rob getting a great case of hypothermia post-digging out said snow cave. Why this trip only happened once, we may never know, but the dream to have a nice big warm cabin may have been born in the same frozen-filled breath on that trip. The goal of starting a mountain home for our family to enjoy, grow into, and provide memories for both ourselves and others is only a goal we're extremely grateful to have obtained. To own a beautiful slice of mountain paradise pie means the world to our entire family, we could not love our home more. We chose our home (after Rob & Cindy toured handfuls of houses & researched handfuls of handfuls beyond that) for multiple reasons: we knew having a hot tub in the mountains, after a long day of skiing in the winter or biking/hiking in the summer was a necessity. The fact we have one in a gorgeous built-in deck surrounded by the sky and trees, is a supremely added bonus. Another added bonus: the huge (lay down) cedar sauna, located under the deck & right out of the walkout basement. The colossal vaulted ceilings, ornately rustic antler chandeliers, grand windows in all rooms giving those picturesque views all year long, & the overall cozy yet elegant yet dramatic features of the home had us sold in no time. We pictured our family and friends spending time up there so suitably well - with all the different types of bedrooms & beds, functional living, sleeping & entertaining spaces, and easy access to the house yet private cabin feel - we knew this was the house for us. YES! We are ONE of the ONLY homes in Summit County to house AC, perfect for those few smoldering summer days. TV in every bedroom. 9 TVs total with cable access. toys & games for all ages! check the cupboards under the family room TV for toys & the white hutch in the living room (by the dining room) for games! We have a landscaped side/front yard (back yard is more natural & forest-like) that provides great privacy yet does not block your surrounding views! Great access to all Summit County Ski areas including Keystone, Breckenridge, Copper Mountain and Arapahoe Basin. Surrounded by world class golf courses; Raven Golf Club at Three Peaks is in our neighborhood! Public course, check online for rates & tee times. Sauna is accessed through the lower level walk out. Hot tub on back deck available year round. Snow removal is provided after big snow storms to make access easy. We had a great time with our group enjoying this house! Great location and super clean! Thanks! We stayed for three days with a family of 10 adults and 6 small children. The home was fabulous - lots of room for everyone. The kitchen and bathrooms were very well stocked and the house was immaculately clean. The beds were comfortable and well suited for our mix of adults and kids. Having bedrooms in the basement and on the top floor was helpful, keeping sleepers away from the noise on the main floor. My family of 10 adults and 4 children stayed here over the Thanksgiving Weekend. The house is very homey and outfitted with most everything needed except for personal belongings and food. The owners and property managers were very accomodating. 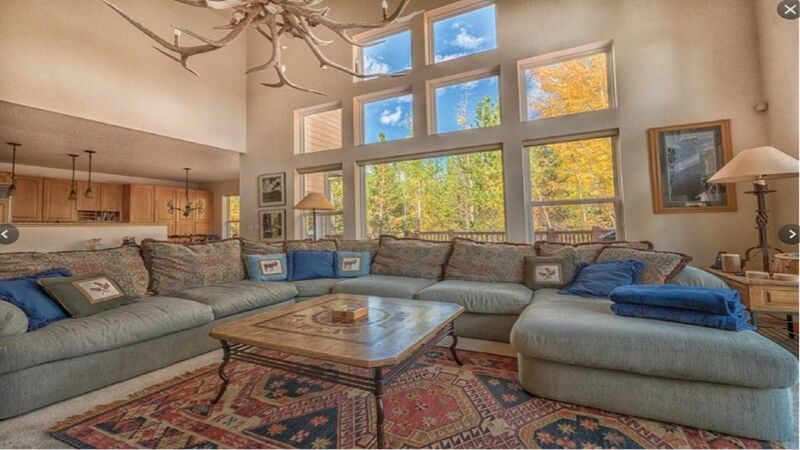 The property location is very convenient to shopping and ski areas are not far away at all. A great time was had by all in our group. I highly recommend the property. We rented this VRBO for a very special occasion and walked away disappointed. The house was in rougher shape then we had expected and the attention to detail was lacking. Many of the light bulbs were burnt out and no replacements. No dishwasher soap, ran out of trash bags, and many of the air freshener cans were empty. Several of the rugs throughout the bathrooms and kitchen were very dirty. The house could use a paint job and the deck needs stained. Not worth the money we spent. We are so sorry to hear that your stay at The Summit Lodge was less than desirable. Our main goal is to always have our guests check-in to our home with it being clean, bright, & detail-oriented; Furthermore we strive to have our guests check-out happily knowing their needs were met for both themselves and that their family & friends had a great time & want to come back. We deeply apologize that this is the experience you did not have. We have numerous replacement bulbs for the lights throughout the house in a cupboard in the laundry room, as well as additional dishwasher soap under the kitchen sink. I’m so sorry you ran out of trash bags during your stay, I know that is frustrating while on a trip vacationing at a residence, I’ve ran into that situation myself. Our property manager states in their Welcome email to you that they supply a certain amount of trash bags, but we have in the past always had extras under the sink or in the laundry room for our guests; Again, we do apologize there weren’t both supplemental trash bags & air fresheners to make your stay the best it could’ve been. We’ve also additionally removed & replaced the old/dirty rugs to give our home a brighter feel, we thank you for bringing this to our attention. And while I can’t personally speak to the paint job of the house (it was done shortly prior to us buying the property) I can say that the entire back deck was very recently stained (less than 2 months ago) by my father-in-law; he takes great pride in both the interior & exterior of the house & finds any free weekend to improve our mountain getaway home. We do appreciate your feedback immensely, and only wish you would’ve contacted us directly and/or our Property Manager during your stay so that we could’ve made these wrongs, right, and made your stay & special occasion much more memorable & enjoyable. 309 Red Hawk Circle was the perfect place for our family reunion. Eight adults and 4 children. Plenty of bedrooms for privacy and the downstairs was a nice hang out for the kids. We didn't even use all the beds. The cozy couch in the great room was the hang out for games and watching some baseball and conversation. The kitchen was well equipped with all the utensils we needed for big dinners. The hot tub was a highlight, right off the kitchen so we could keep an eye on the kids. The pool table was a big hit with the 10-12 year olds and the adults. The Sauna was an added bonus. A wrap around deck was delightful on the sunny days. The table was easy to move into the shade for family dinners outside on the deck. Plenty of towels for the hot tub and bathrooms. We felt very comfortable letting the kids ride their bikes around the neighborhood. The owners were very easy to contact and quick with answers to any questions. There is a big driveway for all the cars. We would definitely consider 309 Red Hawk for our next get together. We had a family get together at Eagles Nest and really enjoyed our stay. The house was beautiful, clean, and had everything we needed. There was plenty of bedding and towels for everyone. It has a wonderful, large outdoor deck and hot tub that allowed us to all sit out there and enjoy the outdoors. The owners were very responsive when I had problems getting Netflix to work so that I could get a movie for my grandchild. He called right away and took care of the problem. I highly recommend this house for family reunions.